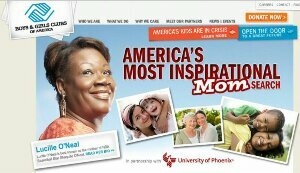 Boys & Girls Clubs of America has joined with University of Phoenix to execute the “Most Inspirational Mom” scholarship search, which will award three extraordinary moms with full-tuition scholarships to pursue an undergraduate or master’s degree. creating great futures for parents and youth. Fifteen finalists will be chosen and notified in February, and the three ultimately selected as “Most Inspirational Mom,” will be announced in May during the week leading into Mother’s Day. ATLANTA, GA (January 8, 2014) – Boys & Girls Clubs of America has joined with University of Phoenix to execute the “Most Inspirational Mom” scholarship search, which will award three extraordinary moms with full-tuition scholarships to pursue an undergraduate or master’s degree. The deadline for nominations for the search is January 30th, self-nominations will also be accepted and more information is available by visiting www.bgca.org/moms. The questions asked during the initial submission are designed to help nominees explain how they inspire their families and communities, and how an education from University of Phoenix will help to enhance their efforts. To learn more about the scholarship search, please visit www.bgca.org/moms or view the video about the search here: http://bit.ly/BGCA7. For more than 100 years, Boys & Girls Clubs of America (GreatFutures.org) has enabled young people most in need to achieve great futures as productive, caring, responsible citizens. Today, more than 4,000 Clubs serve nearly 4 million young people annually through Club membership and community outreach. Clubs are located in cities, towns, public housing and on Native American lands throughout the country, and serve military families in BGCA-affiliated Youth Centers on U.S. military installations worldwide. They provide a safe place, caring adult mentors, fun, friendship, and high-impact youth development programs on a daily basis during critical non-school hours. Priority programs emphasize academic success, good character and citizenship, and healthy lifestyles. In a Harris Survey of alumni, 57 percent said the Club saved their lives. National headquarters are located in Atlanta. Learn more at http://www.bgca.org/facebook andhttp://bgca.org/twitter .